With its evergreen forests, grasslands, and cascading waterfalls, Khao Yai National Park offers abundant scenic beauty and numerous hiking trails. Along your trek, you'll cross paths with some of the 300 species of birds and mammals common to Thailand, like elephants, bears, otters, and monkeys. If you don't manage to see everything in one day, consider spending the night on one of the campgrounds. 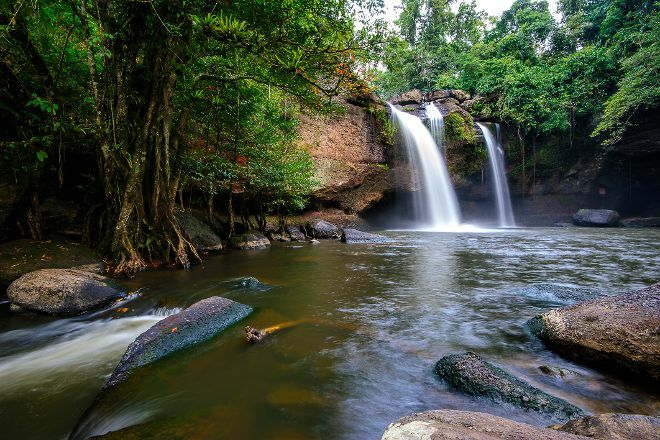 Add Khao Yai National Park to your Pak Phli travel itinerary, and discover new vacation ideas by using our Pak Phli trip builder . Lots of nature; very happy on its behalf. I stayed in a tent for a couple of nights and it was really nice and enjoyable. From time to time you'd hear someone trying to scare away a deer that got lured to their food. The staff I met at the information center was terrible. Little information and no will to work. The only thing they told me (again and again) was that I needed a ranger to guide me through the trails (3rd onwards). I did number 5 on my own and it was amazing. With some orientation notions you can walk freely.. even though there weren't any hints when the path divided, there were marks on the trail (5/2300 meaning 2300m of path number 5). I suppose that hiring an experienced ranger could be really good, especially if you are not used to wandering in the forest and spotting animals, but it strongly depends on who it is. It is pretty easy to hitchhike through the roads inside the park, if you don't mind sitting is some pickup truck full of bottles (true story). Highly recommended for a hint of nature. Oh.. and beware of the leeches. Would have been great to see elephants but I didn’t spend that much time there. Will definitely go again !